Again thank you and others for posting so many great photos. I suspect the boy and his dog took many a long trip in that T just as it was. I know I did that in the T's my Dad had in the garage -- even the ones up on blocks! Note it is the wide arm rest body with the 5 piece rear tub with the curve bead to follow the fender. That style was used 1915 until it was phased out around 1921ish when the 3 piece rear tub and narrow arm rest replaced it (with some over lap). It hard for me to see if it has the 1915-1916 rear fender or the later 1917-1925 style crowned rear fender. And although the front fender has been slightly damaged�.we can see that it does NOT have the bill of the 1915-1916 fenders. So assuming those fenders, rear seat section have not been swapped out over time it would place the car in the black radiator 1917 � 1920ish time frame. And because it has the accessory 5 lug demountable wheels I would say it is more likely in the 1917- early 1919 time frame before the four lug demountable wheels supplied to Ford by Kelsey and also Hayes became readily available on a touring. But of course it could have been a 1920 and they got a really good deal on the accessory wheels that beat the Ford price for the 4 lug ones. I believe the young fellow is talking to his dog and says: "Your right Fido, we can save these parts in the yard and someday we will sell them on E-Bay and we will park the car in the barn and tell them it is a barn find. I'm sure we can make enough to buy some dog food for you." Yes, the kid is extremely wealthy. 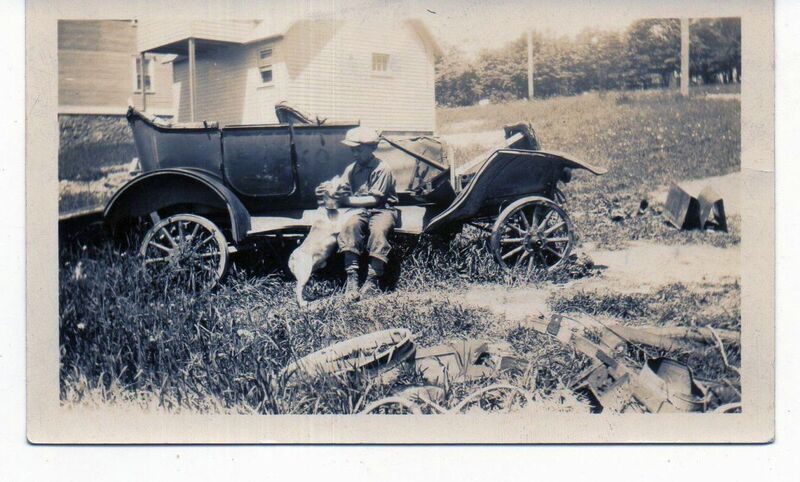 He has a dog, hat, suspenders, boots, long underwear, and a Model T. Wish I still had those kind of long lazy summers.